Two days after Crystal and Kevin left, we were happy to have another visitor – Lynn’s sister Catrina. The boys were excited to see her! She came bearing gifts of Legos, books, a frisbee for the park and candy for the boys. She was so generous to fill her suitcase with some American food we’ve been craving and can’t seem to find (or refuse buying at such ridiculous prices!). Peanut M&M’s, Oreos, Kraft Mac n Cheese and Hidden Valley Ranch Mix – yes, nice and healthy I know. Amazingly, Trina didn’t display a drop of jet lag so we were off and running! 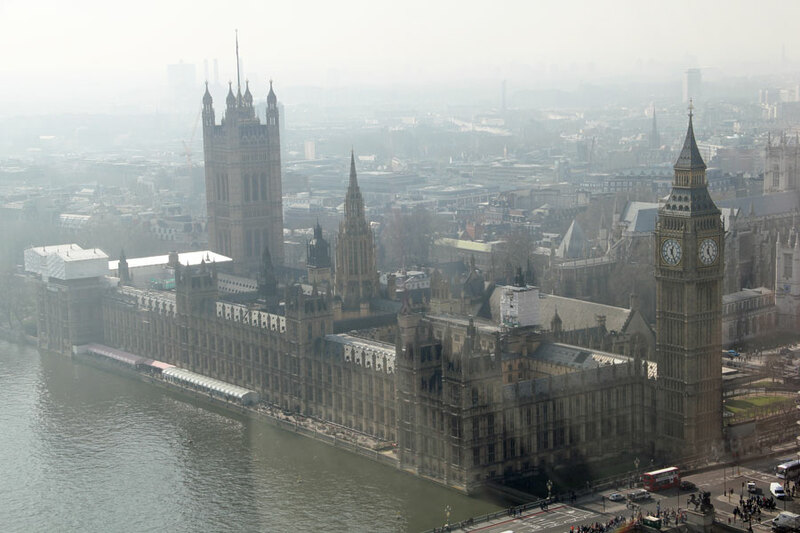 I took her down to Westminster to walk around Big Ben, Parliament, Westminster Abbey and all the traditional tourist sites there. We met up with Lynn and got dinner at our favorite little French restaurant nearby. Nathan spun around 50 times while waiting for the tube without getting dizzy! My dad had his brain tumor surgery the day before she arrived and I still hadn’t heard the results given the 16 hour surgery and time difference. I was so anxious for him to wake up and know he was okay. Having the love and support of family has helped us feel closer to home during this incredibly stressful time. I’ve never been so relieved than to hear how successful his surgery was and the positive prognosis for the future, though the recovery would be long. We are grateful for technology that connects us across oceans and lets us see each other. Surprisingly, we’ve never been inside Westminster Abbey so we loaded up the kids and took the tour. It was extremely packed, but absolutely incredible inside. We were greeted by a delightful and accommodating man, Martin, who was happy to lead us on a little personal tour to find an ancestor Tyler had recently discovered in our family line. Somehow we are related to the first Duchess of Gloucester and were shown her tomb in a special room. Tyler had all sorts of questions, which Martin was pleased to answer and welcomed him back to the library for more genealogical research. I have learned to look up when touring any old structures in Europe. It’s simply fascinating to see the intricate, ornate and beautiful ceilings. These photos from the web display a small peek inside this fascinating structure. 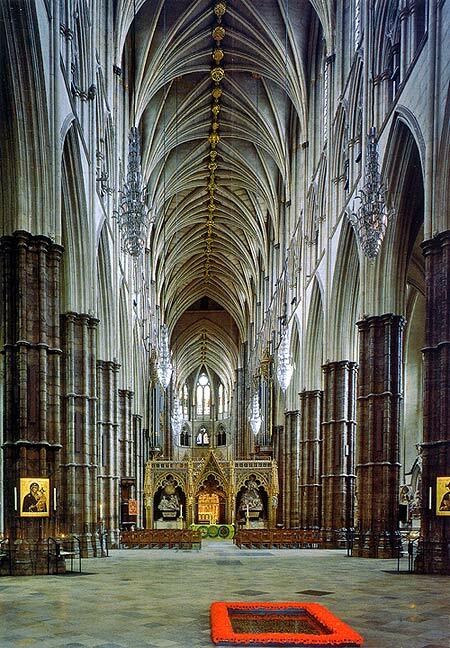 Westminster Abbey is the tradition place of coronation for English royalty. It’s difficult to take in so much visually at once while learning the elaborate history as you go along. A few interesting things I learned was that King Edward the Confessor began its reconstruction, formerly known as St. Peter’s Abbey, as a grand burial site for himself. One week after its consecration in 1066, he died and was buried there. It took another 25 years to be completed. 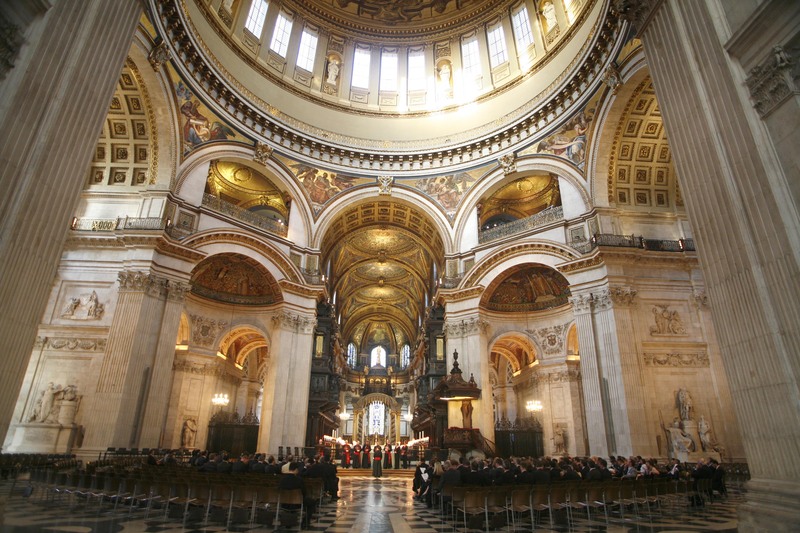 Also, the saying “robbing Peter to pay Paul” refers to money donated to St. Peters that was diverted to pay for St. Paul’s Cathedral. 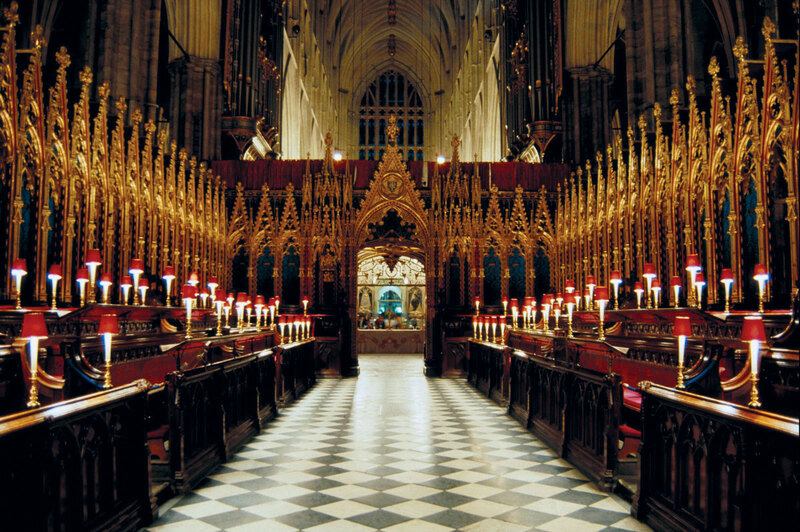 This is where all coronations of Britain’s kings and queens have taken place for the last nearly 1000 years. 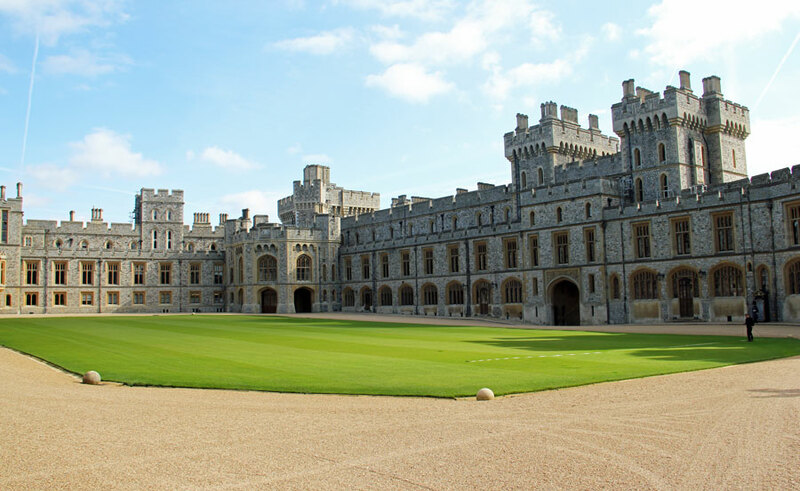 In most recent history, it is where Prince William and Kate were married–only a very small handful of royals have that privilege. 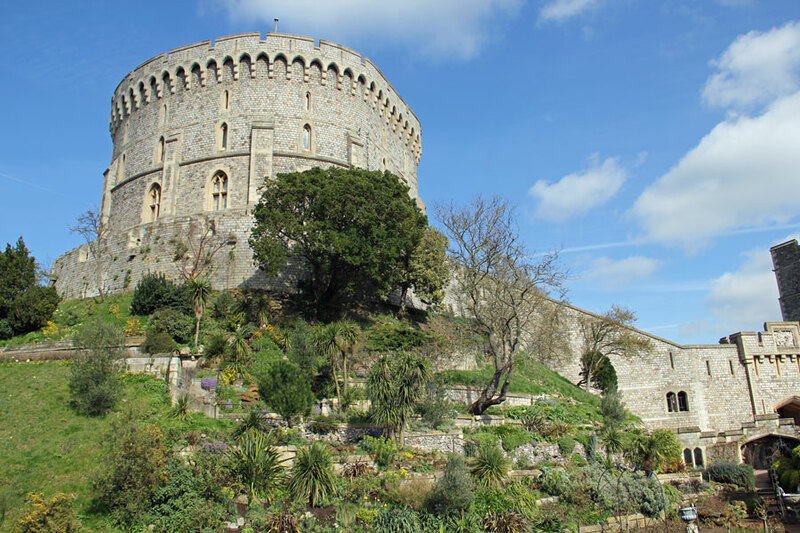 Over 3,000 notable people are buried there as well, including many monarchs, Sir Isaac Newton, Charles, Dickens, Charles Darwin and many, many others. We went to the Chapter House there which was encased with amazing stained glass windows, each telling a story. We loved seeing the windows about the discovery of America. Below the windows are a series of special paintings from the 1400s that are the best preserved example of “International Gothic Style” in England. Though quite worn, they once displayed 96 scenes or visions of the Apocalypse from the book of John. Descriptions of each scene were once labeled on parchment beneath them, now gone. 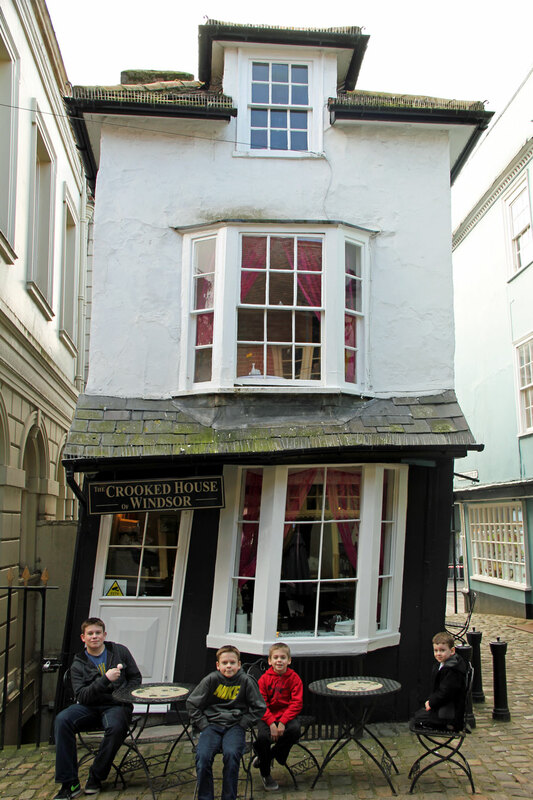 The little boys knocked on Britain’s oldest door (from 1050), but no one answered. 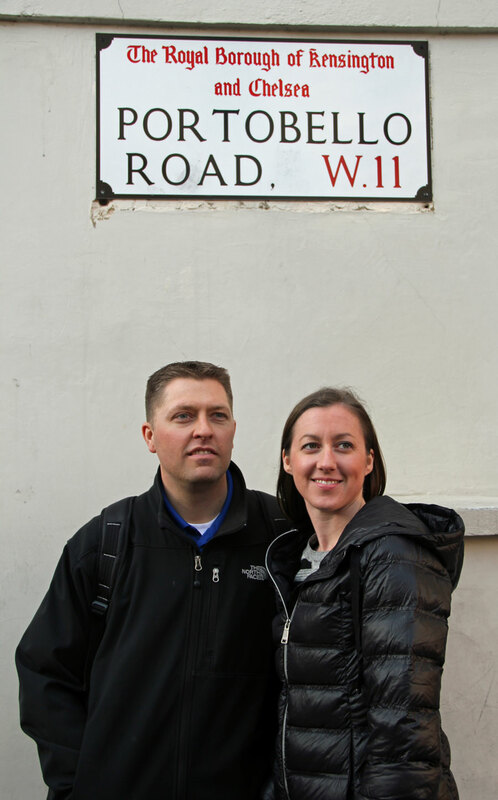 We walked all around the Westminster area, trying to avoid the crazy demonstrators that were picketing the area. With fantastic spring weather, we trekked over the bridge for some lunch. Trina was introduced to her first Bento Box. We all had one and loved it, the kids’ were the best I’ve seen. I miss Japanese food from home. Next up was Trafalgar Square where we stopped for Tyler’s favorite historical artifacts shop. 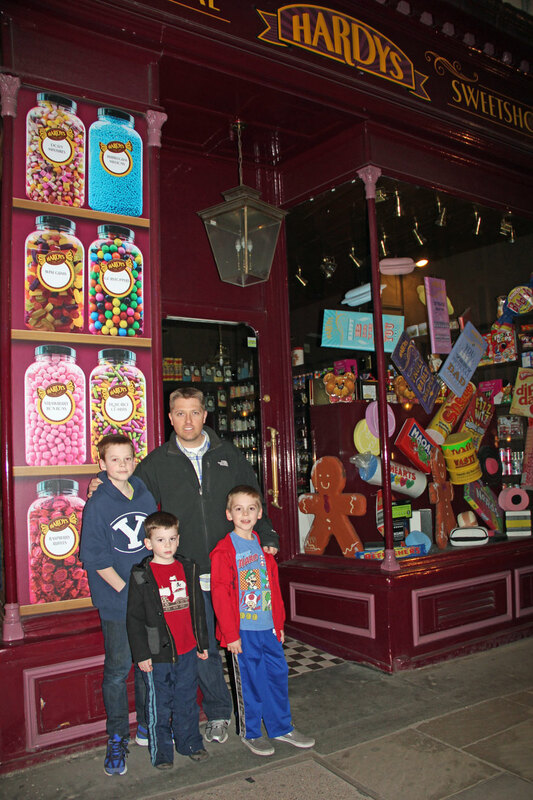 We walked around Picadilly and shopped at the Swatch store on Regent Street for some souvenirs for her kids. The night was finished with delicious crepes in South Kensington. Sunday morning was spent at church. 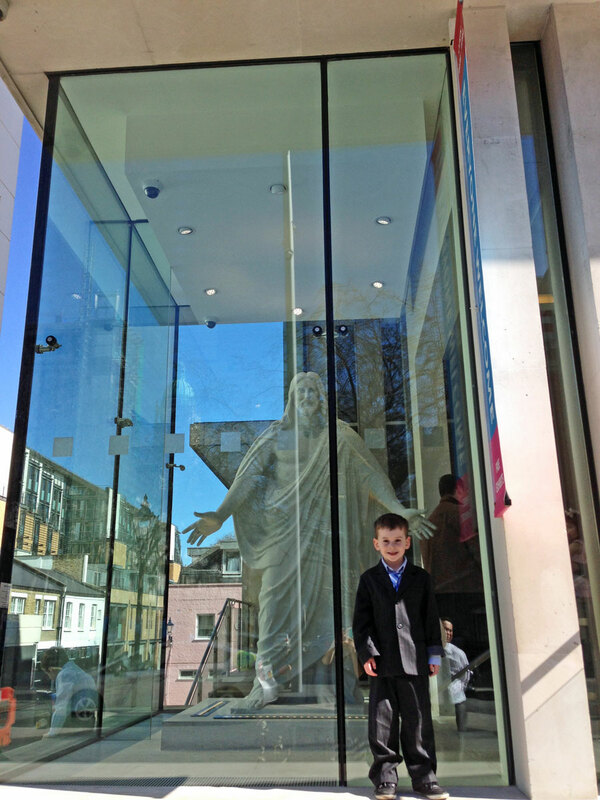 After lunch, we left the kids for a bit to head down to St. Paul’s Cathedral. The doors were open so we went in to check it out. They were preparing for an evening service, but we had a few minutes to stare in amazement at the grandeur and awesomeness of everything. I can’t even imagine how, or who, could have painted the ceiling of the dome so high up at its construction so long ago. 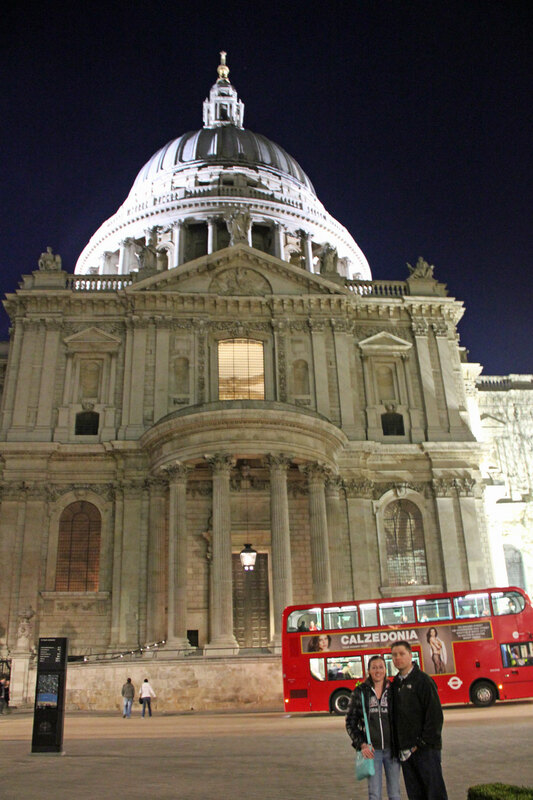 St. Paul’s Cathedral is one of London’s most well-known sights, as the church of England’s cathedral that dates back to the design of Sir Christopher Wren in the late 17th century. For 250 years, it was London’s tallest building, once the same location as the original church dedicated to the apostle Paul in 604 AD. 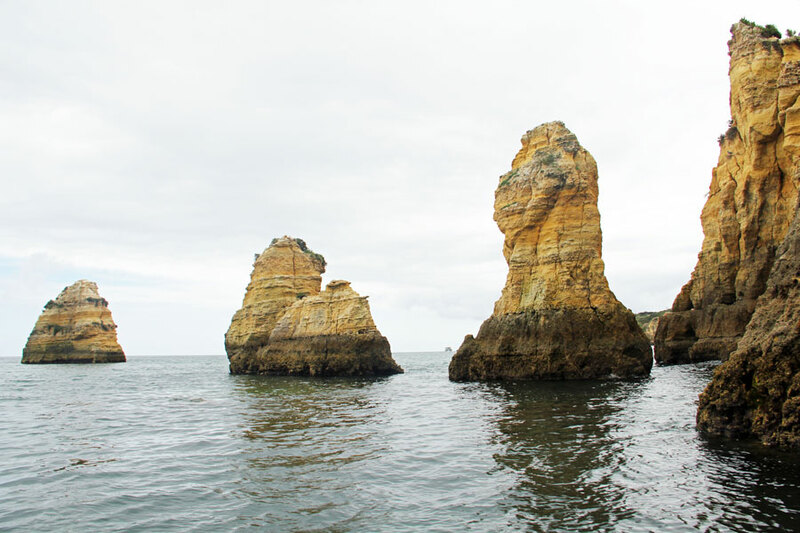 It is definitely a place that needs to be seen to appreciate. Incredible. 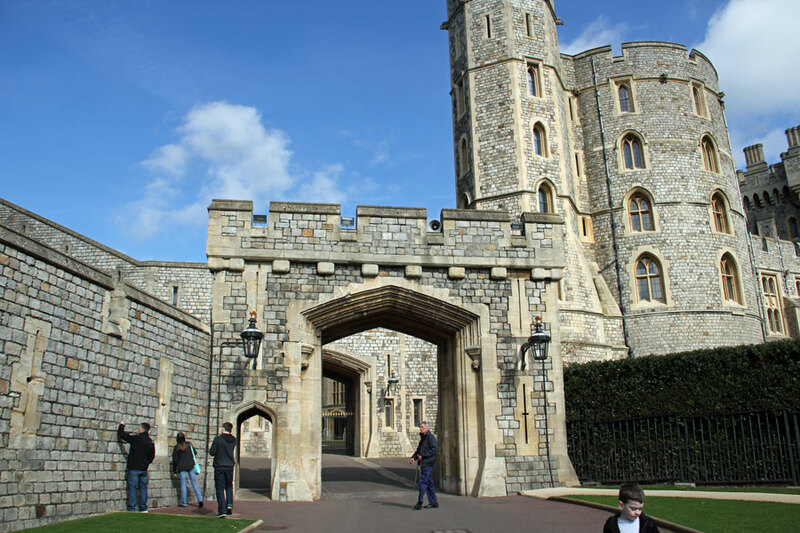 Many notable events have taken place here, including Princess Diana’s wedding to Prince Charles, Queen Elizabeth’s II Jubilee celebrations, funerals for Margaret Thatcher, Winston Churchill and peace services at the end of world wars. Crossing the bridge to Southwark, we stopped in at the Tate Modern Art Museum with high hopes of being amazed. Art is definitely in the eye of the beholder. While there were some nice pieces, we saw a lot of unusual displays such as this galvanized metal construction that reminded me of something I might see in my garage. Once they move the Tate to their newly constructed building, I will give them another chance to impress. We stopped in to show her Lynn’s office and made our way back to the kids. Changing of the Guards is always fun to see if you’re new to London. With crowds of people, and many warnings of pick pocketers from police, we squished together to catch what we could see of the royal guard marching in. We lucked out with front seats on the double-decker bus headed back to Kensington. Jace wanted to show Aunt Trina his favorite dinosaurs at the Natural History Museum. We checked out a few other exhibits before heading out for lunch. We had to show Trina the Aurora Collection – all of the world’s natural colored diamonds and how some glow in the dark, since her husband is in the diamond business. Cade watched the little ones so Tyler could take Aunt Trina to a true British pub from the early 1800s right around the corner from our flat, named Britannia. Of course we had to show her traditional fish and chips with mashy peas. Tyler loved his bowl of mussels and can’t wait to return to his new favorite pub. 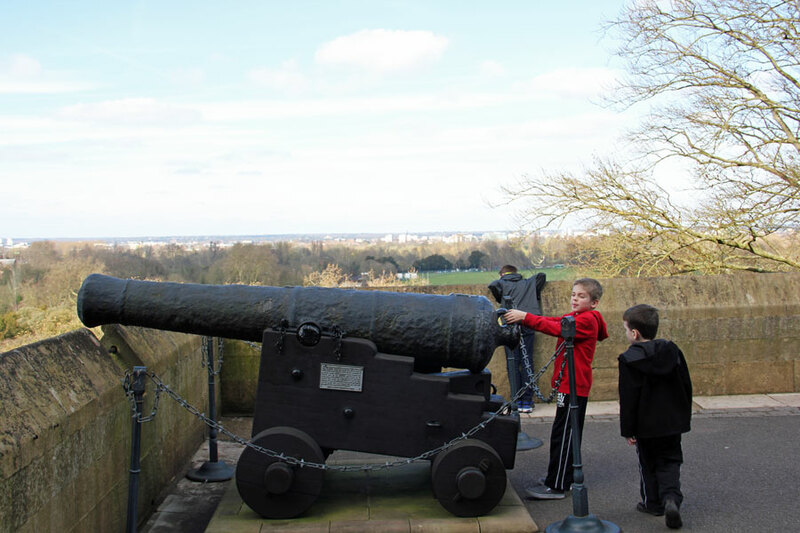 Now it was Cade’s turn to come to Kensington Palace with us for a little tour. 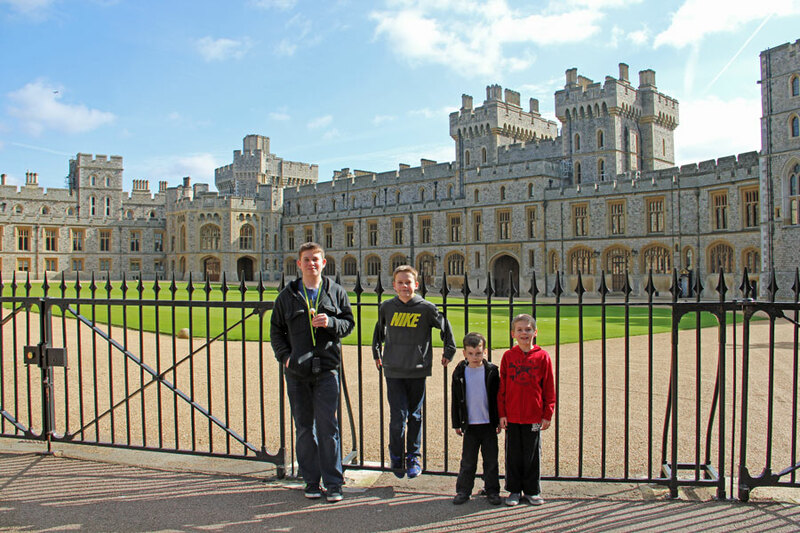 This is where Princess Diana raised her boys for the most part and where William, Kate, baby George, Harry and others live today, in a separate part of the building. Seeing some of Queen Elizabeth’s and Princess Diana’s dresses they wore years ago was my favorite part. I remember loving this low-waisted, blue dress on Diana and getting a similar style for my 6th grade graduation. Completely 80s. Cade asked me, “Why would you want to make your legs look so short?” Good question. The most depressing part was reliving the anguish of Queen Anne’s heartache as you walk through rooms learning about her 17 unsuccessful pregnancies and the boy she lost at 11 years of age who was in line to be King. Queen Victoria’s family once lived in the palace as well, and we learned more about her large family and the adoration she had for her husband, Albert. A stop by Harrod’s was a must. Cade helped pick out a souvenir for his cousin in the Lego section of the elaborate toy department. Trina and I had a girl’s night out at a show. We had so much fun at Mama Mia, I’ve never been to such a high energy show where everyone is on the feet dancing and singing along at the end. Now I can’t stop singing all my favorite ABBA tunes! Since the boys and I had our oil painting class, Lynn had Trina come out to his office to meet up for lunch. 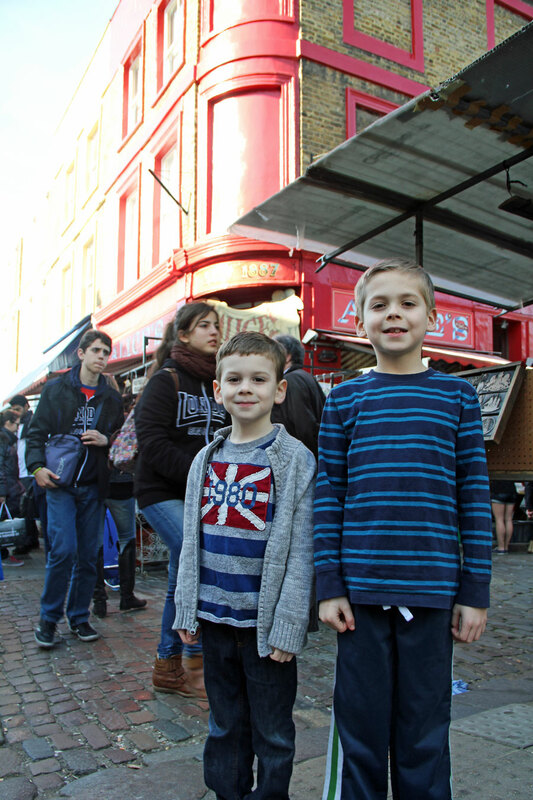 He took her down to Borough Market where they ate and explored. 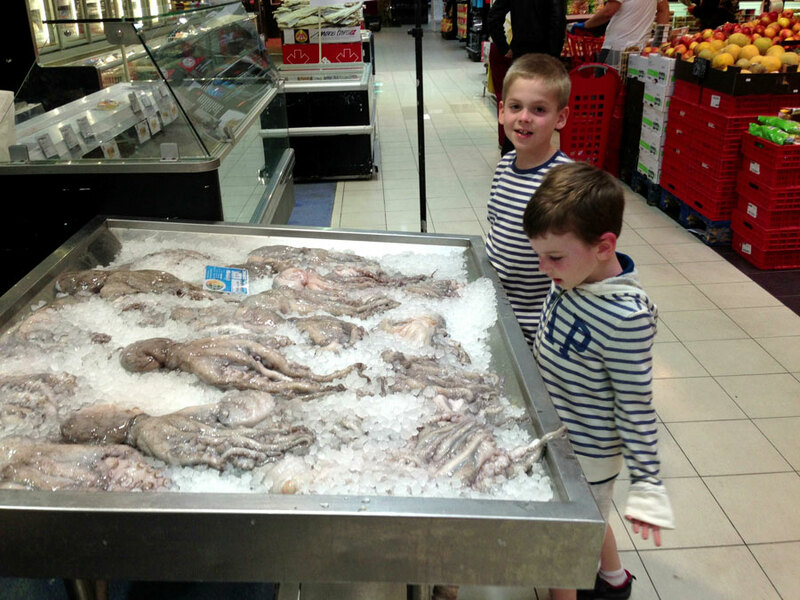 We shopped a little more and hung out with the kids. We finished off the night with Lion King. We’ve been wanting to see it for a while and finally got the chance. The costuming and sets were so creative and captivating. The kids loved all the animals and music. 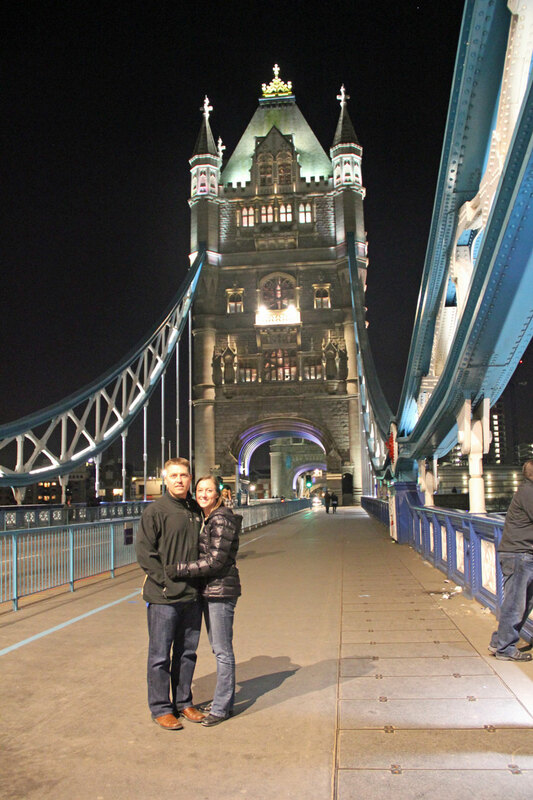 Tyler and Trina left early so he could show her around the Tower of London. It’s his favorite place here. We met up and switched off so Cade could take Trina to lunch at Nando’s, his favorite place nearby for spicy chicken and endless frozen yogurt. With drizzly weather, we adjusted our plans to see a castle and opted to go on a boat tour to see the city from a different view. Unfortunately we weren’t able to see much since the kids wanted to stay dry inside the boat. It’s always hard to see family go. The time flies way too quickly. We absolutely loved spending the week with Catrina and making unforgettable memories. Thank you to her awesome family for making it possible for her to come out to see us! We wish all our family and friends a very Happy Easter today! We had grand plans of taking family pictures in the beautifully blooming parks, but the rain storms never let up this afternoon so this picture will have to do this year. One I took while waiting for our bus to church this morning . We had to adjust all our Easter traditions quite a bit this year. Little did I know how hard it would be to find essentially everything I needed for Easter egg hunts and filling their baskets. I couldn’t even find a single Easter basket anywhere. Maybe I need to venture out of the city more or perhaps they don’t do things quite the same as in America. Or maybe I should start earlier, but life has been so hectic I feel like I’m constantly throwing things together at the last minute. So this year will be known as the Easter bags. All they care about is what’s inside anyway, which was very underwhelming this year too. I wanted to do our annual egg hunt, but finding plastic eggs to fill was a big fail as well. Where do people get things here? And where’s all the jelly beans? The holidays always make me miss Target and Costco…and home. 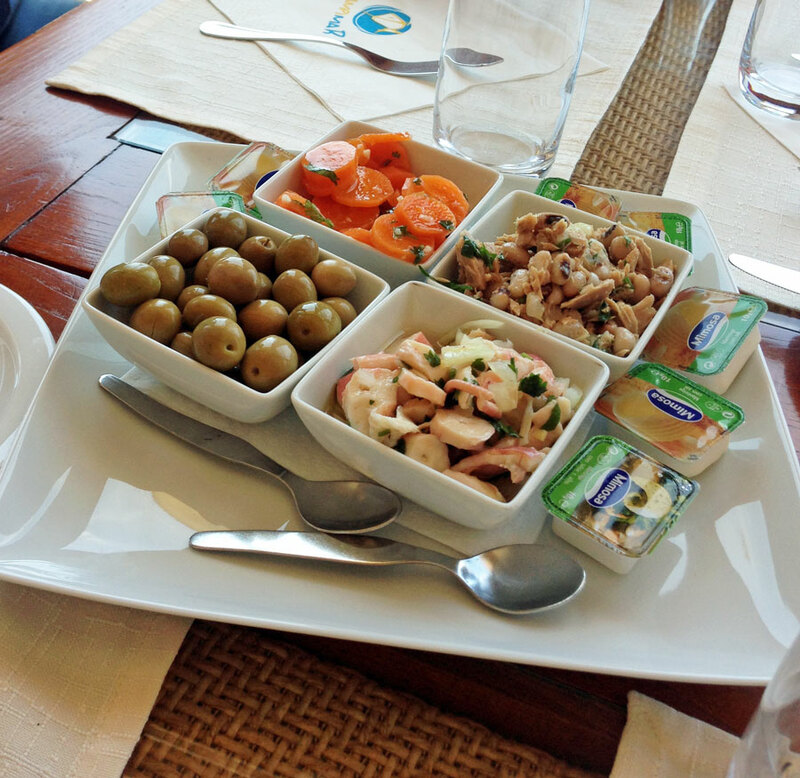 We had our own little version of our traditional dinner with ham, potatoes, broccoli and rolls – none of which were homemade or with our usual recipes, which kills me. I’m having to get over not doing things exactly like home. I’m pretty sure I’m the only one who cares, but I should just be grateful for all the time I’m saving not baking rolls, making pies and frosting cookies. Truly, none of that matters because we were able to spend the day together as a family and reflect on the incredible gift of the Savior’s life and atonement and what it means for each of us. And that is a tradition we will never change. It seems each year my kids turn older, I have a hard believing they’re growing up. Nathan turning 9 the end of March was definitely that feeling – where has the time gone? He joined our family as a sweet, mellow baby with a full head of thick hair and we instantly fell in love. 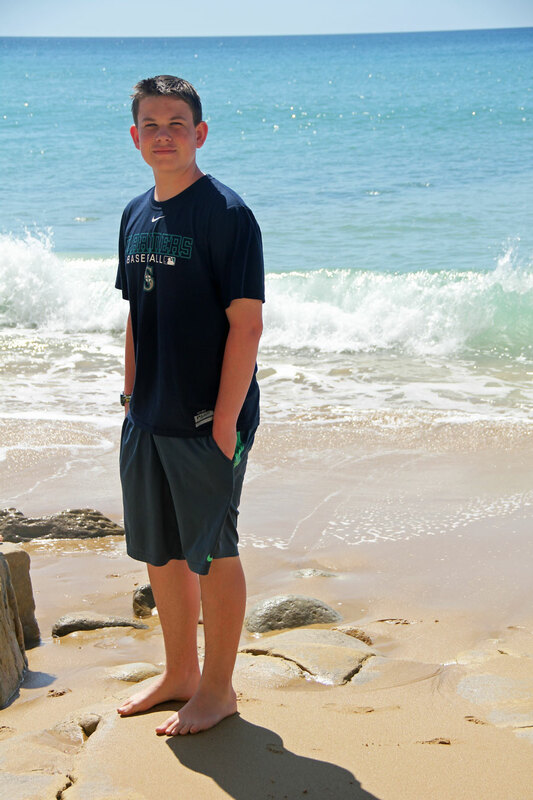 Though there were days (many) that I didn’t think I could keep up with his energy and strong will, I am so proud of the caring, intelligent, sensitive boy he has become. Our whole family has been so sick with bronchitis, ear infections and the flu and Nathan was the only soul to escape its wrath. The pictures are pretty telling how the rest of us are feeling! 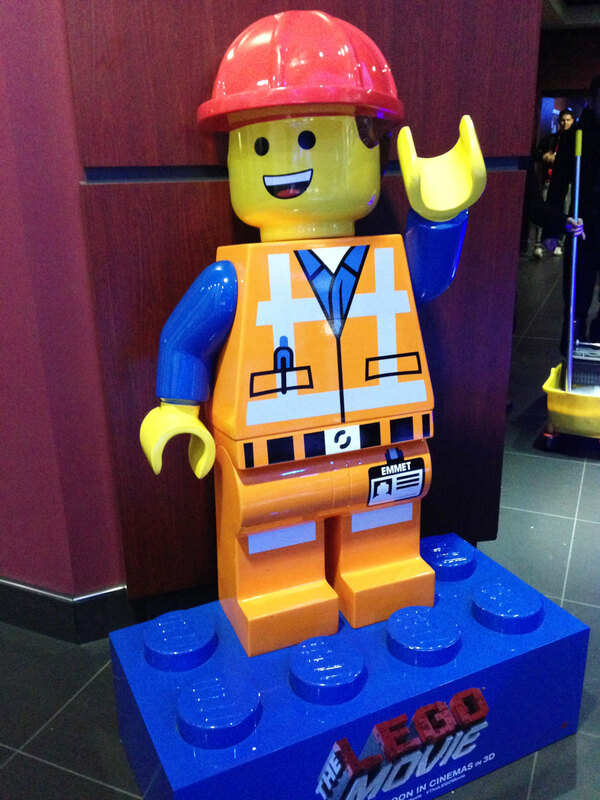 We mustered up the energy to go see the Lego Movie yet again since it’s his favorite movie ever and he hadn’t seen it with me yet. After the movie, Nathan was dying to open his gifts. Having shaken them, he was feeling confident they were his favorite toy. No need to be creative this year. All he wants and plays with are Legos. I mean, hours and hours of Legos. They are worth every cent for the amount of creative play and joy they have provided this boy! Lynn and I are in constant amazement with what this boy can build, whether he’s following elaborate directions or building creations on his own. He has recruited his little brother in his passion, which makes for a very messy room most days while they’re constructing and playing. He calls it his burglar alarm to ward off potential robbers. Man they hurt to step on in the night! The boys each took turns giving him their gift, which brought a big smile to Nathan’s face. Both grandparent’s gifts arrived too, which he loved. He’s been having championship tournaments with his new game. Nathan specifically wanted banana splits instead of cake and made his wish. Within a minute, the ice cream was inhaled and he was busy building. I don’t think he stopped for 2 days. We’re so used to sharing a celebration with grandpa Jenkins (having a birthday the day after), it felt weird not to be near him this year. But we got to call and facetime with him and sing him “happy birthday” in his hospital bed. How blessed we are to have more birthdays with him! We’re pretty lucky to have Nathan a part of our lives too. Happy birthday buddy! We love you. Timing is a funny thing. Wanting to return home immediately upon hearing about my dad’s health, and being advised not to, I was grateful that my sister Crystal and her husband Kevin were able to carry out their plans to come out to see us. It felt like a piece of home with them here during this rough time. 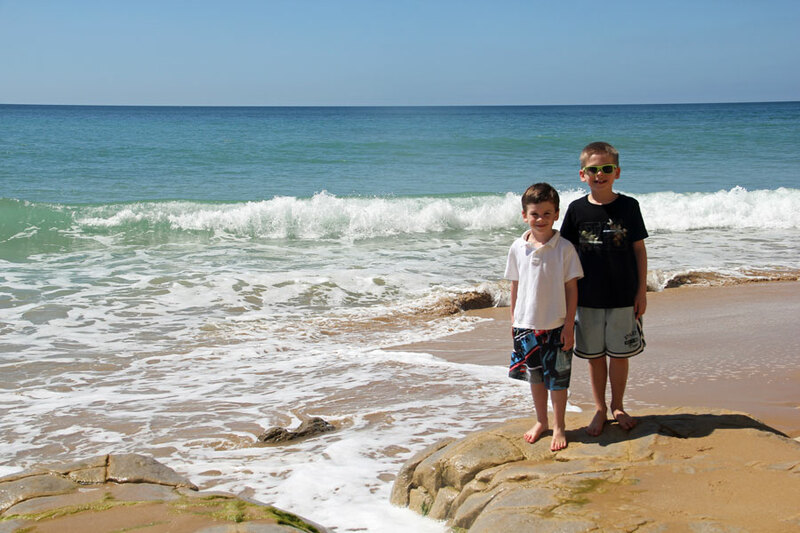 This was both their first time to England and we decided to pack as much in as we possibly could. The weather could not have been more glorious all week, blue skies and sunshine near 70 degrees! With Jace now having an ear infection and horrible cough and Cade still on the mend, they stayed home to recuperate for a few of our outings. First up was Big Ben of course! 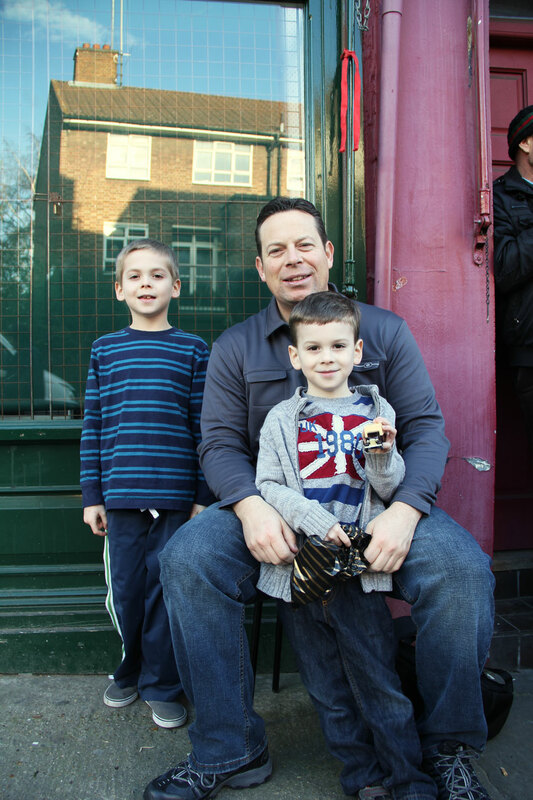 It’s a must to get pictures in the perfect spot with the telephone booth, even if we have to wait in line a bit. We walked all around Parliament and arrived just after they closed the doors to Westminster Abbey and St. Margaret’s Church, but admired it from the outside. There’s no way to capture the magnificence of the architecture here, it needs to be seen in person to truly appreciate and grasp its scale. With jet lag kicking in (at least with Kevin! 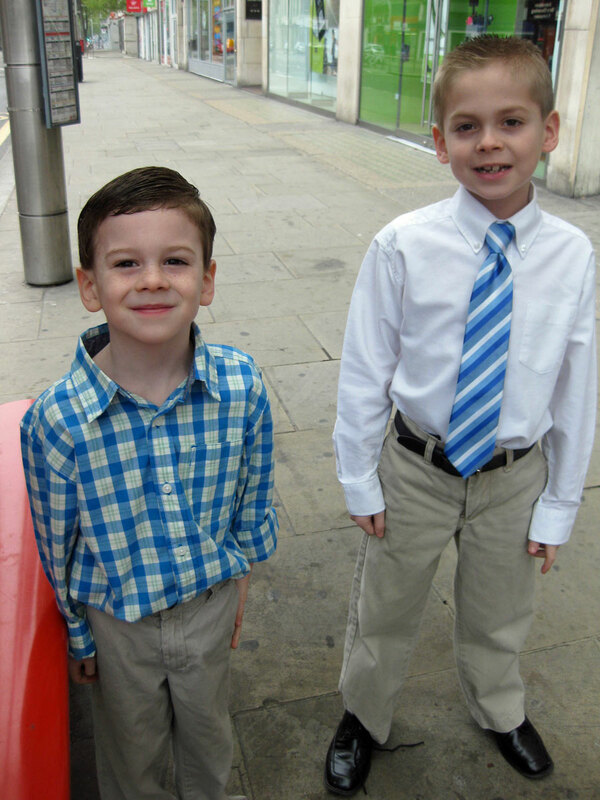 ), we forced them to stay awake a little longer and took them on a stroll through Green Park. The park was absolutely beautiful. I’ve heard how lovely spring is here and I can see why now. Tyler attempted to make friends with a nearby goose, nearly losing a finger in the process! We got double ice cream cones and made our way to Buckingham Palace. Because the changing of the guards schedule didn’t jive with our plans, we decided to just show them Buckingham Palace without all the fan fare. 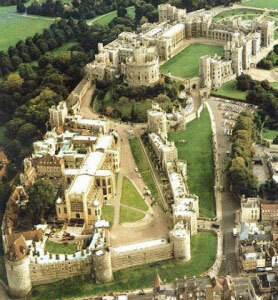 It’s definitely not as exciting and easy to see why the Queen loves Windsor Castle in comparison. We briefly showed them Trafalgar Square before the sun set and walked down Oxford and Picadilly. I think they crashed pretty quickly back at our place and caught up on sleep for another packed day. Crossing the Westminster Bridge over the Thames River has the most spectacular views. I just started my first oil painting of this very scene, I love it so much. 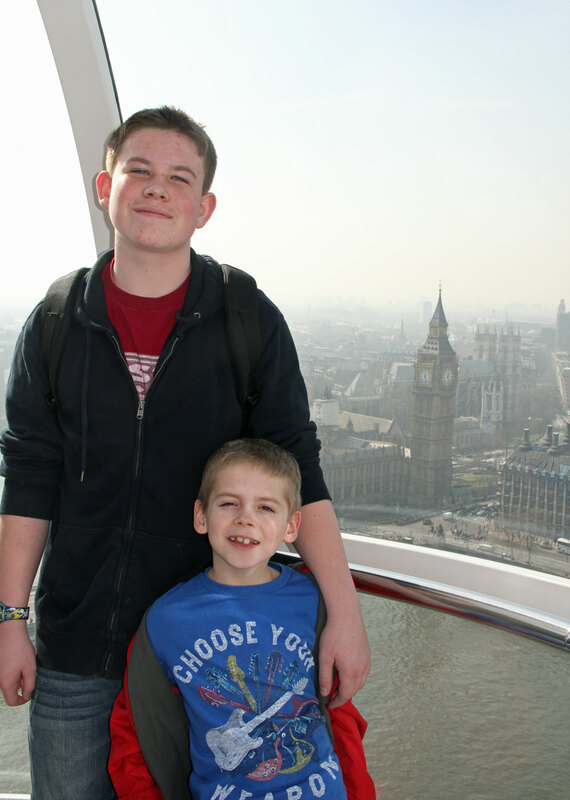 Clear skies made our view from the London Eye perfect. 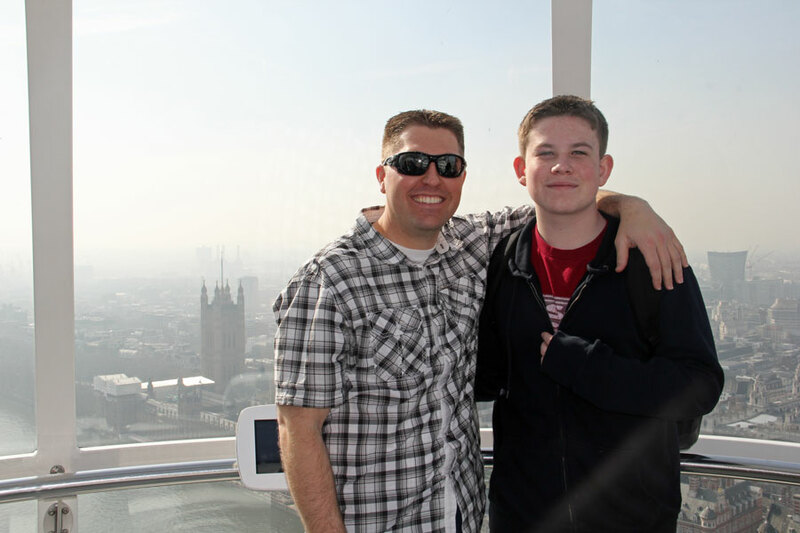 Inside the largest ferris wheel in the world, we were able to see a magnificent skyline! We’re still learning what the majority of the buildings are, but it’s so vast and beautiful just to take it all in at such a height. We felt on top of the world up top! 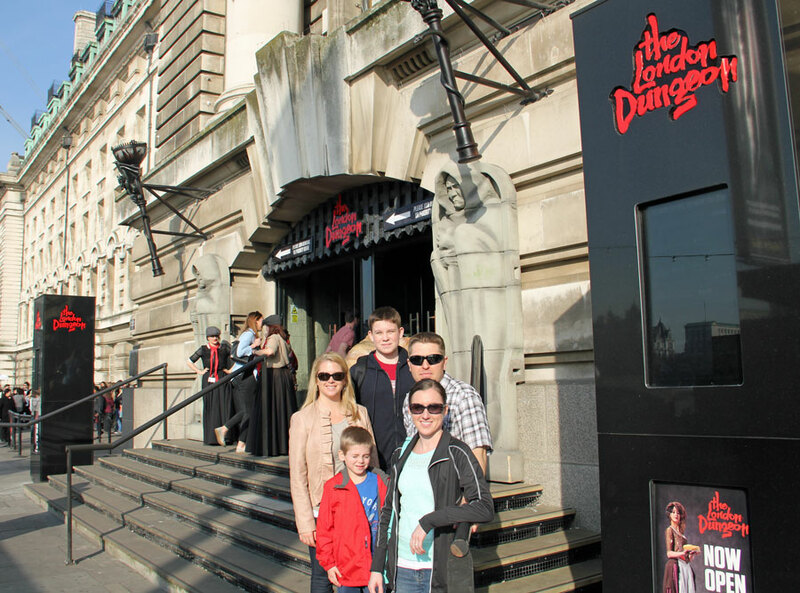 The London Dungeon tour was not as good as it was hyped to be. 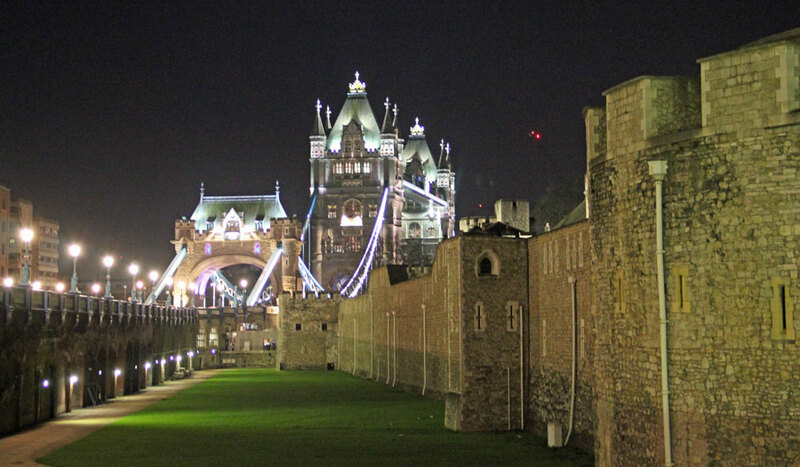 We were herded through the depths of smelly, dark spaces to experience the recreations of gruesome stories of London’s history with Jack the Ripper, Guy Fawkes, beheadings of Henry VIII’s wife and the like. Tyler thought it was great, but I think we adults would like those 90 minutes of our lives back! Sometimes you stumble on the greatest finds. All Bar One for lunch was a nice surprise of modern British food. Kevin experienced the fish and chips with mashy peas and we all loved our meals, which is rare at a British joint. It’s not easy deciding on a show here, but the vote was to see “Once” again since they heard how much we loved it the first time. What we didn’t know was nearly the entire cast had changed and they had a fill-in for the lead lady so it wasn’t nearly as good, but I still loved the music. On our way there, our taxi driver pointed our Prince Phillip, Duke of Edinburgh (and husband to the Queen) in his car next to us. I was astonished to learn he is 92 years old, not looking a day over 70 in my eyes! They headed out early Friday morning to Paris for Kevin’s birthday and spent the night right near the Eiffel Tower. I think they had fun doing the tour bus and seeing the major sites there. 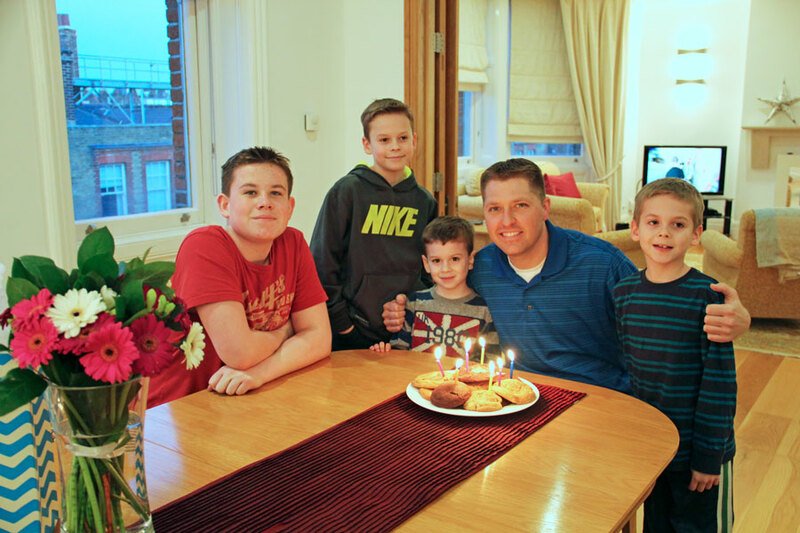 Saturday afternoon, they returned and we celebrated Kevin’s birthday with his new favorite cookies from Ben’s Cookies. They really are so much more delicious than they appear! 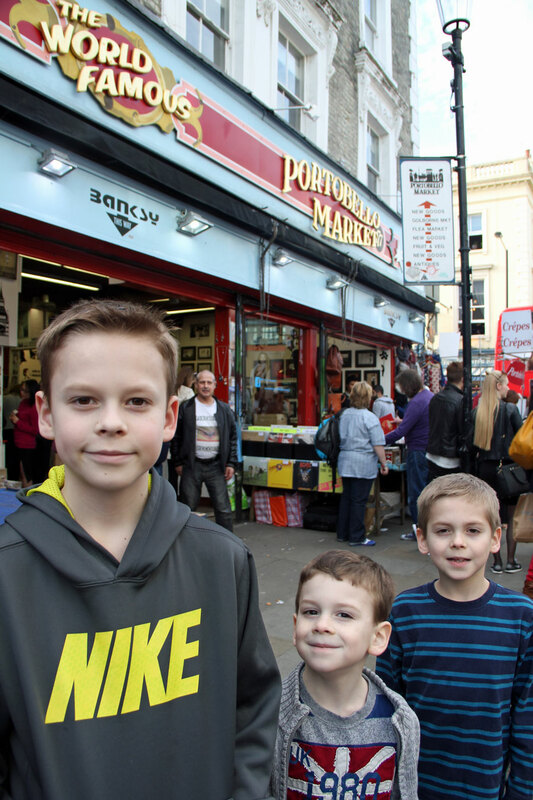 Since Portobello Market is only open on Saturdays, we headed there to explore and shop. They found some fun things for their four girls. Low and behold, we bumped into Tyler, Cade and their friend Mike who happened to be there too! It’s Tyler’s favorite place on the planet. 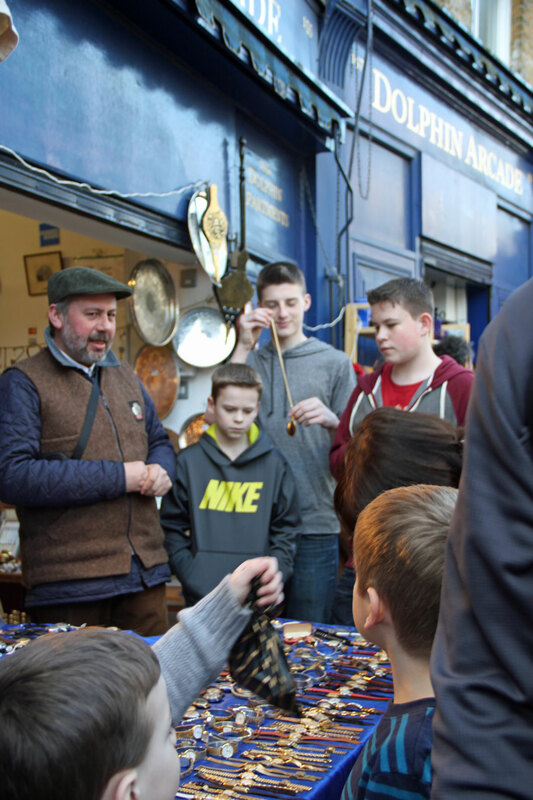 He may be the only teenage boy to truly appreciate antiques I know. 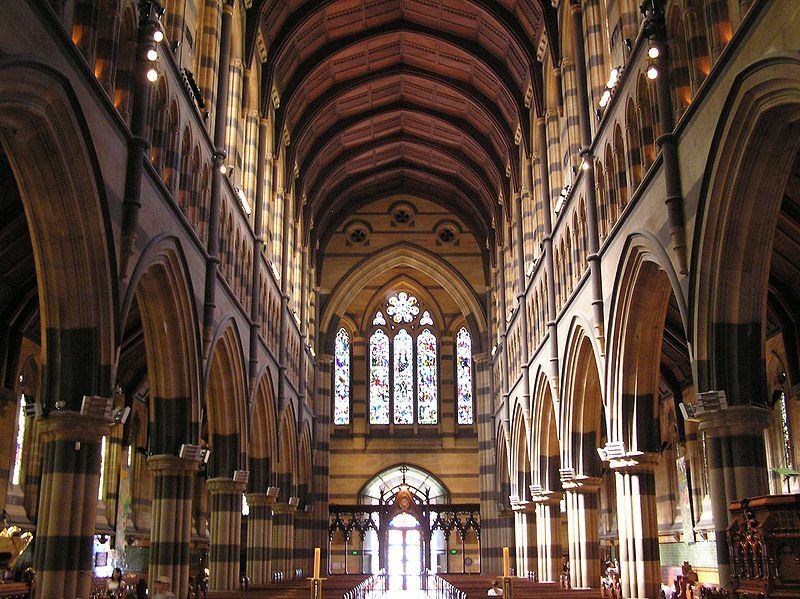 We walked down Kensington High Street and stopped in St. Mary Abbot’s church on the corner which we’ve always wanted to do. You could spend hours in just about any building, reading all the rich history of days and people long past. Hyde Park was full of people. This weather really brings the locals out. 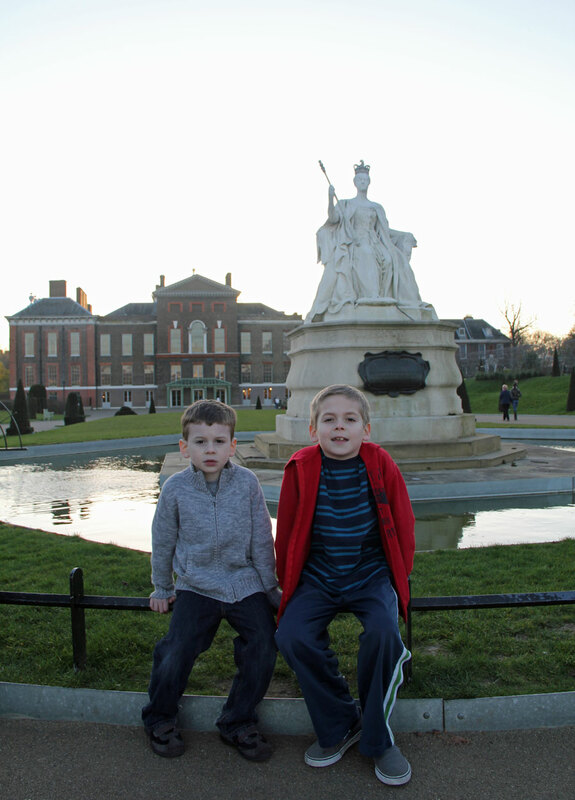 They checked out the grounds of Kensington Palace. Our favorite duck pond was under construction, so no feeding the birds today. Unfortunately our favorite little Italian restaurant was booked for dinner so we chanced it going to a different one we knew nothing about. Sadly, it disappointed but the company was nice! 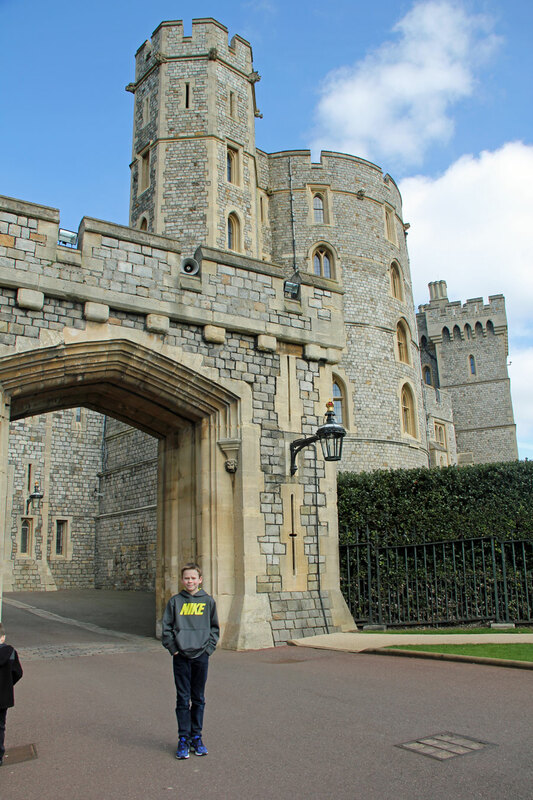 They were able to explore inside the Tower of London and see a few other sights on their own. We all rode the double decker bus to church. 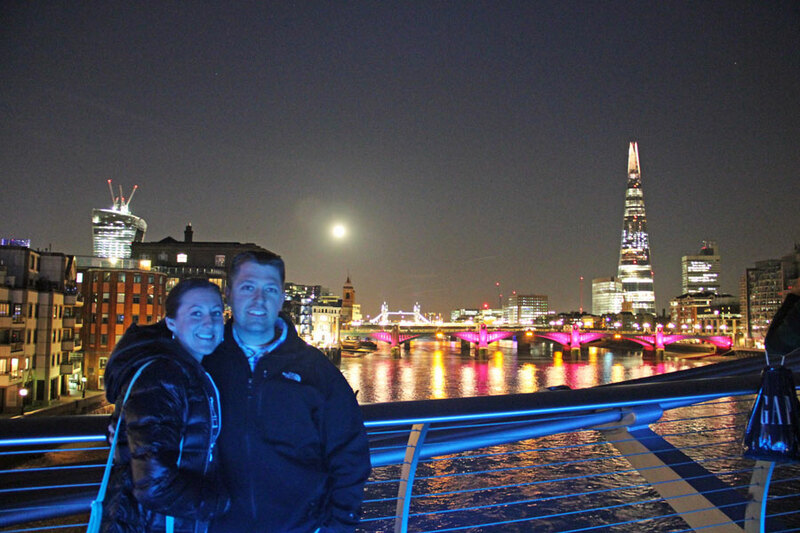 Later that night we went to St. Paul’s Cathedral, showed them our first flat, and walked along the passenger bridge to Tableau to show them Lynn’s office. 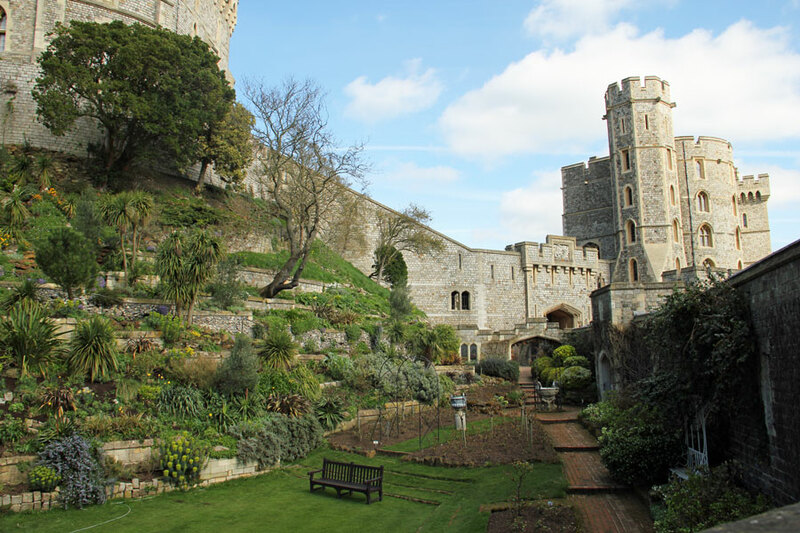 Monday was spent at Windsor Castle again. Cade wanted to see it this time, but unfortunately Lynn had meetings and was unable to join us. Guess we’ll have to go back yet again. The Queen was there again, and we watched her caravan leave and the flag change. 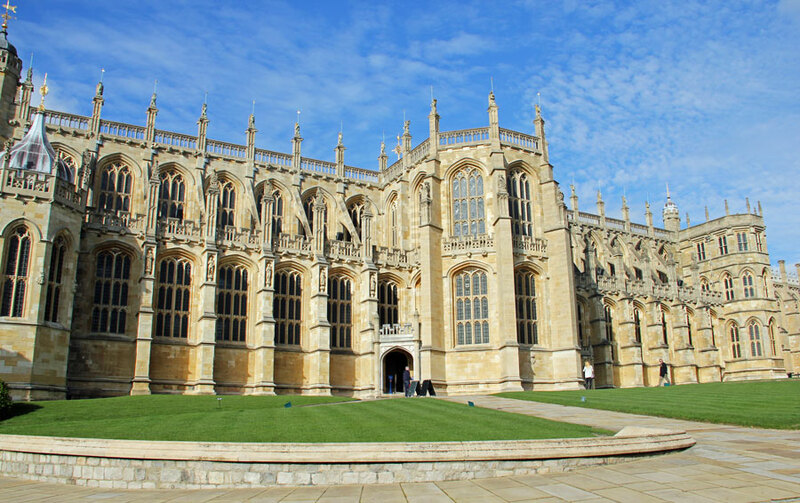 This time we made sure we went in St. George’s Chapel and were not disappointed. 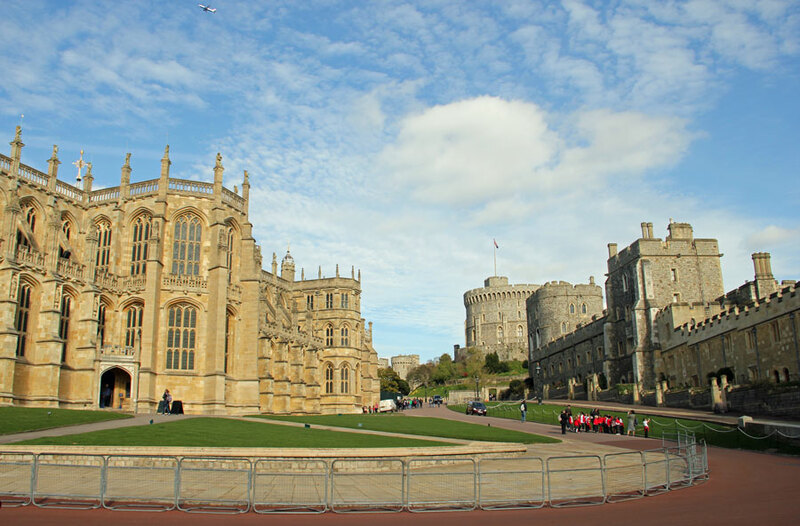 King George IV began its construction in 1475 and it took nearly fifty years to complete. 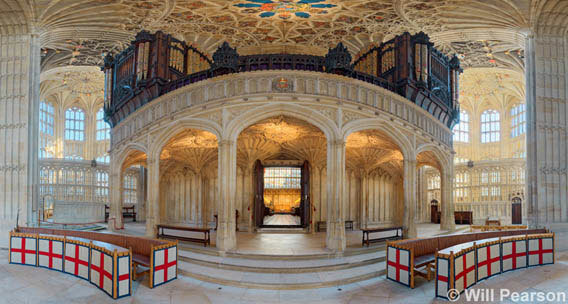 It was built as a chapel for the Most Noble Order of the Garter, Britain’s highest order of chivalry. It’s considered a masterpiece of Late Medieval Perpendicular Gothic. It was an overload for the eyes to take in everything at once. I am constantly amazed at the beauty of the ceilings in such places, in awe how they were constructed such a long time ago given their tools and technology. The Quire area is impressively built with medieval wooden-carved stalls with banners overhead where the knights of the Order assembled. Seven hundred 700 engraved brass plates of former knights attached to the backs of the stalls. Prince William became the 1,000th knight of the order in 2008. Here’s a few pictures courtesy of the web. 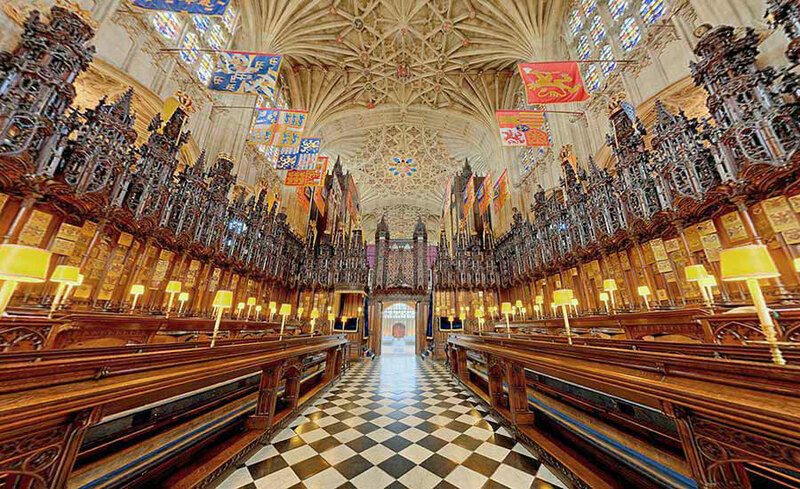 Ten monarchs are buried in the Chapel including Edward IV himself, Henry VIII with his favorite wife Jane Seymour, Charles I, George V and Queen Mary and George VI and Queen Elizabeth the Queen Mother. Several notable weddings have taken place there as well, including many of Queen Victoria’s children’s. 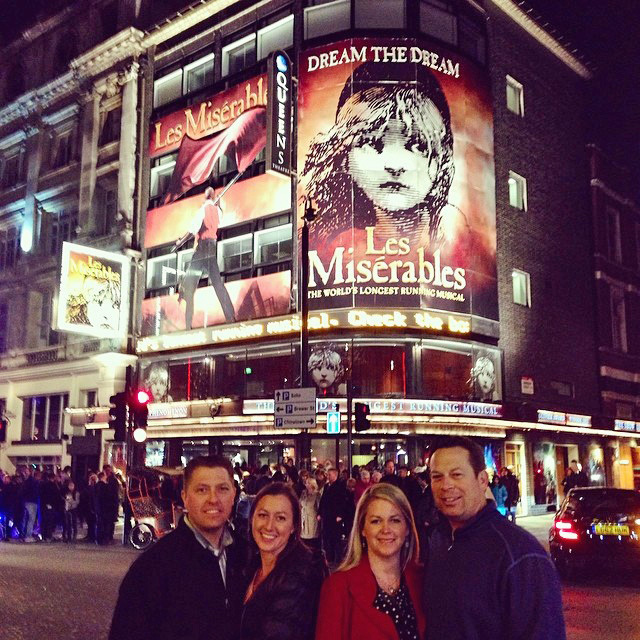 Our grand finale evening was a night out to dinner and Les Miserables. The show did not disappoint with spectacular voices, special effects, creative sets and powerful music. The songs have been stuck in my head for weeks now, which is okay because I love this music too. It was sad to say goodbye, the time flew way too fast! 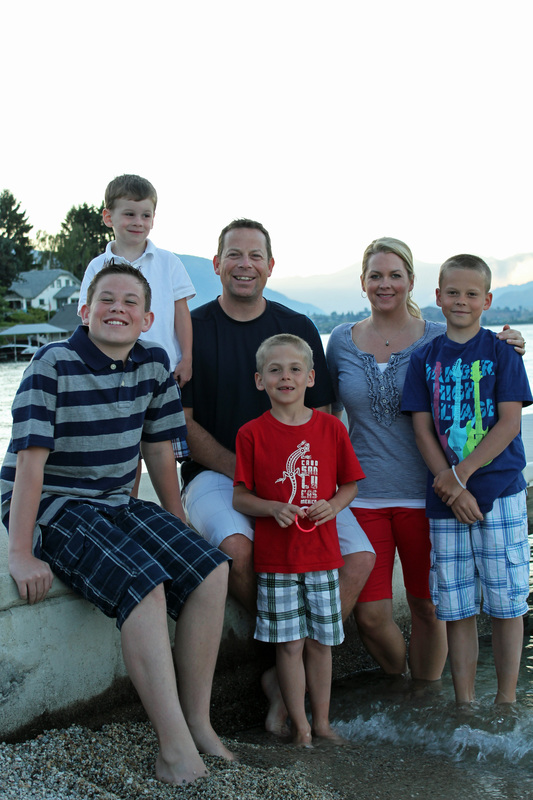 Thanks Crystal and Kevin for making the trip out and experiencing life out here with our crew. Great memories!